CCTV footage showed a man and a woman riding a bike were stopped at the security checkpoint before they blew themselves up. Officers block a road following an attack at the local police headquarters in Surabaya, East Java, Indonesia, Monday, May 14, 2018. 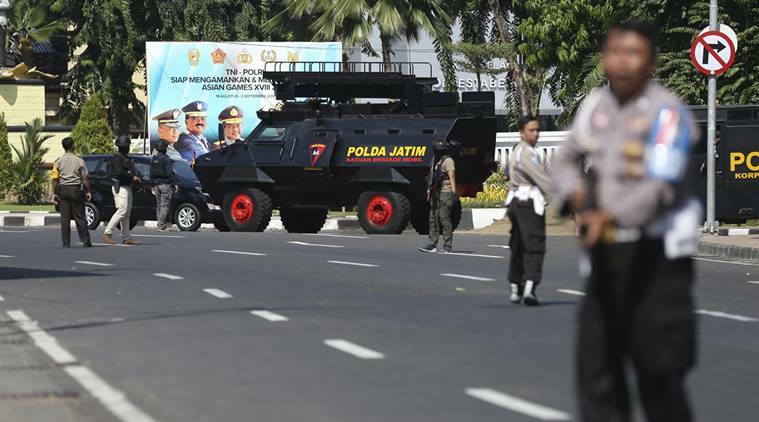 The police headquarters in Indonesia’s second largest city was attacked Monday by suspected militants who detonated explosives from a motorcycle, a day after suicide bombings at three churches in the city. Surabaya (Indonesia): At least one policeman was killed on Monday after suicide bombers struck a police headquarters in Indonesia’s second biggest city Surabaya, a day after a wave of suicide bombing at three churches killed at least 14 people and injured scores of others. CCTV footage from outside the police complex showed four suspected militants being stopped at a security checkpoint before they blew themselves up. Police said the attackers were members of the same family. A young girl accompanying them survived the attack was taken to hospital, they added. On Sunday, a family of six including two young girls exploded themselves at three churches in Surabaya during Sunday services. The attack was claimed by the Islamic State group in which at least 14 were killed. The death toll is likely to rise as more than 40 were injured. Police said the bombers — a mother and father, two daughters aged nine and 12, and two sons aged 16 and 18 — were linked to local extremist network Jamaah Ansharut Daulah (JAD). Indonesia’s president Joko “Jokowi” Widodo condemned the string of attacks as “barbaric” and vowed that authorities would root out and “destroy” Islamic militants. Just hours later, three members of a family were killed in a bomb explosion at an apartment complex about 30 kilometres from Surabaya. Police said the mother and one child died from the explosion and they shot dead the father who was carrying detonator. Two other children injured in the blast were taken to hospital.